For patching existing concrete, overlaying concrete to establish new pitch or wear surface and to produce concrete that may be scheduled for fast track coating. May be mixed in bucket that it comes packaged in or in small or large transit mixers. 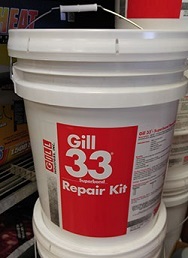 Gill 33® - Superbond Repair Kit is a cementitious, rapid setting all in one bucket kit that includes a specific blend of portland cement and Gill 33® Superbond admixture. Designed for horizontal applications that can be used in a wide range of temperatures from 17 to 100 degrees Fahrenheit.